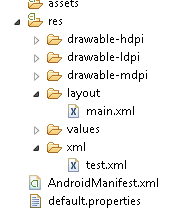 This is a simple example showing how to parse an xml in Androi. In this method the xml file is stored in res/xml folder. First create a folder named “xml” inside the raw folder. Then create an xml file named test.xml and copy the contents into it. This is the XML file we are going to parse. Now the main.xml file. We place a textView to view the contents of the parsing. Now the main java file that does the parsing. That’s all parsing is complete Go on and run the program. Create a class that holds variables for the object and return that object from getAllXML() function, then set the values. pass the edittext objects to the above function and set the values.